Rock Resurrection Art : Holiday Lights Guitar Pick Earrings! A guitar PICK and a LIGHT for each ear! Pick your colors! 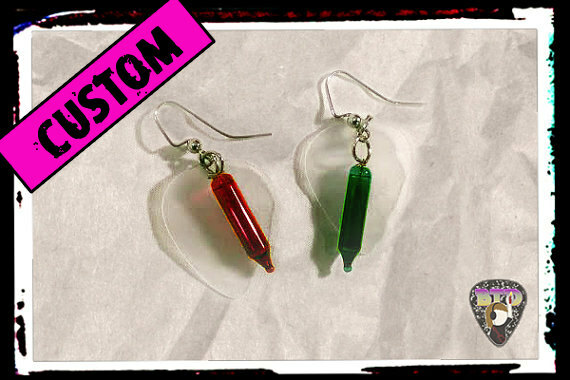 Guitar pick earrings with a different hue of Christmas light! Red, blue, green, yellow, purple, orange and clear are available. Note: Clear or Frosted picks look best with the lights. This makes the color pop and lets natural light in to make it glow. Frosted picks look foggy and translucent. Each pair comes with a cardboard paper backing with more info about Bite-the-dust.com - my rock website. A great look for the Christmas season, but can also be tweaked color wise to go with any time of year!